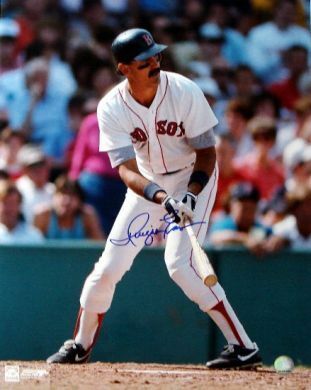 Dwight Evans turns 63 years old today. Evans wore the Boston Red Sox uniform for 20 years! And in that time, he became known as one of the sport’s greatest defensive outfielders of all-time. The winner of 8 Gold Glove awards, ‘Dewey’ was a fan favorite due to his desire to stop the other team from collecting hits and runs. A 3-time All-star, Evans was also known for his power at the plate. During his career he crushed 385 home runs – good for 4th place in Red Sox history. 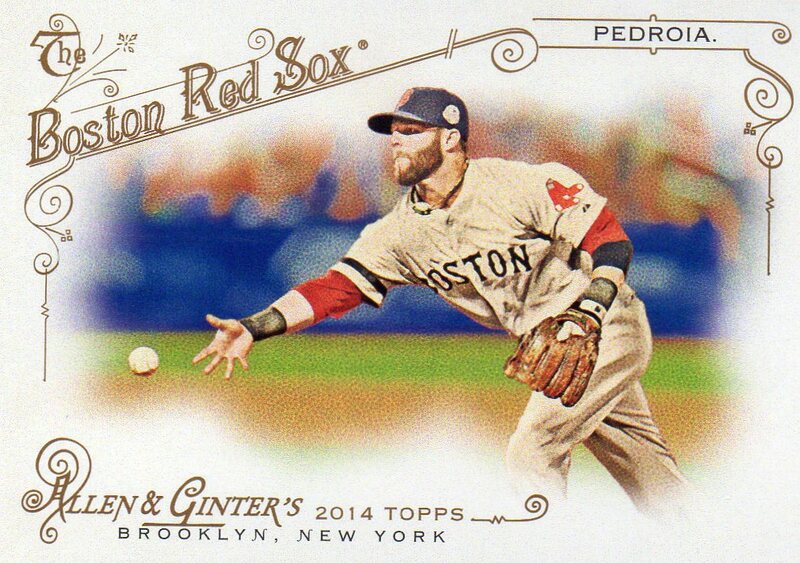 I love action cards that feature Dustin Pedroia making plays at second base. For me, he is one of the most exciting infielders in the game simply due to the way he treats each and every at-bat against his club. He is truly invested in the game and helping his team win. 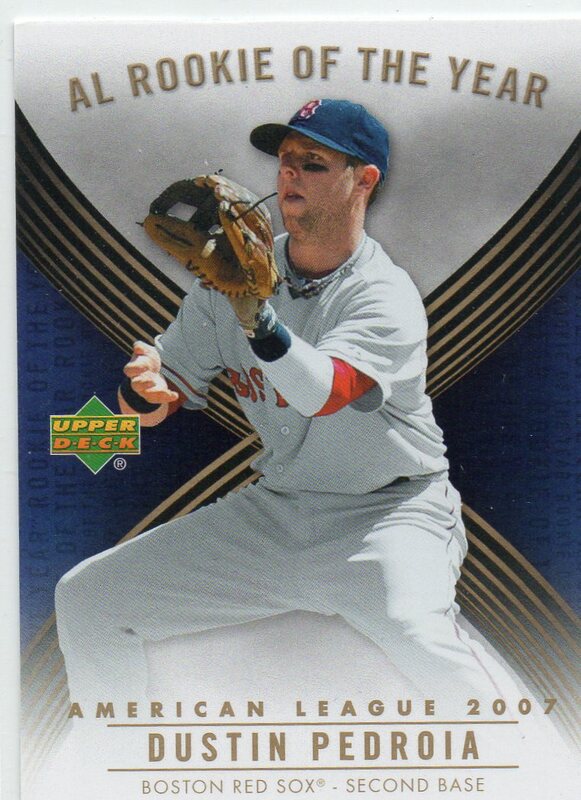 This card of Pedroia comes from the 2004 Panini Donruss Elite Series 2 release. And as you can see below, the card features a nice shot of #15 as he appears to be heading towards a grounder that was hit to his right. I do wish that we got to see more of the action though.. It’s nice to get what we got, but I would love to see the ballpark behind him as well as how close to the ball he is.. Still, as I mentioned with the Bryce Harper card from this set that I featured last week, I do like the oversized ‘E’ in the background. Yessir, I scored this bad-boy for just $0.18 last week during a little shopping adventure on Sportlots.com. 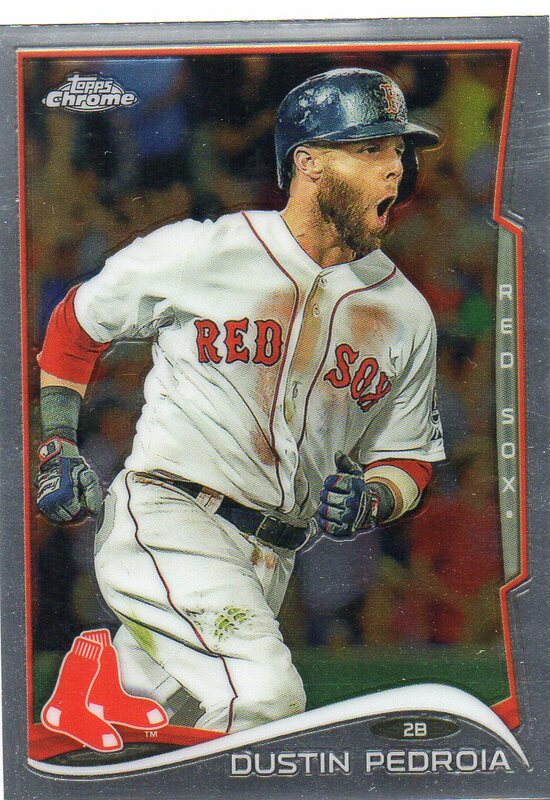 This is the base card of Dustin Pedroia from the recently released 2014 Topps Chrome baseball card set. The Chrome looks great, and it is nicely complemented by all of the Red accents supplied by the Red Sox uniform that #15 is wearing in this image. He may weigh just 165 pounds, but Dustin Pedroia can swing the bat as hard as any middle infielder in the American League. With the bat speed, wrist strength, and hips all going, Pedroia has incredible bat speed. And he has put up some pretty decent home run numbers for a second baseman too. For his career, Pedroia has connected for 106 total round-trippers. From 2008-2012, Pedroia averaged double-digit homers with his career high of 21 coming in 2011. His power swing is captured nicely on his new 2014 Bowman Platinum baseball card. With his season over and his hand recovering from surgery, I thought it would be more exciting to go back and enjoy more positive times in the baseball world of Dustin Pedroia. Pedroia was chosen as the American League’s Rookie of The Year in 2007, and he staked his claim as a young superstar in a big way. The numbers: .317 batting average, .380 on-base percentage, 165 hits, 39 doubles, 8 home runs, 7 stolen bases, 50 RBI, and 86 runs scored. Pedroia also connected for 230 bases as he tallied 24 of the 28 votes cast for the ROY. Here’s to hoping he can bring that game back to the Sox in 2015! 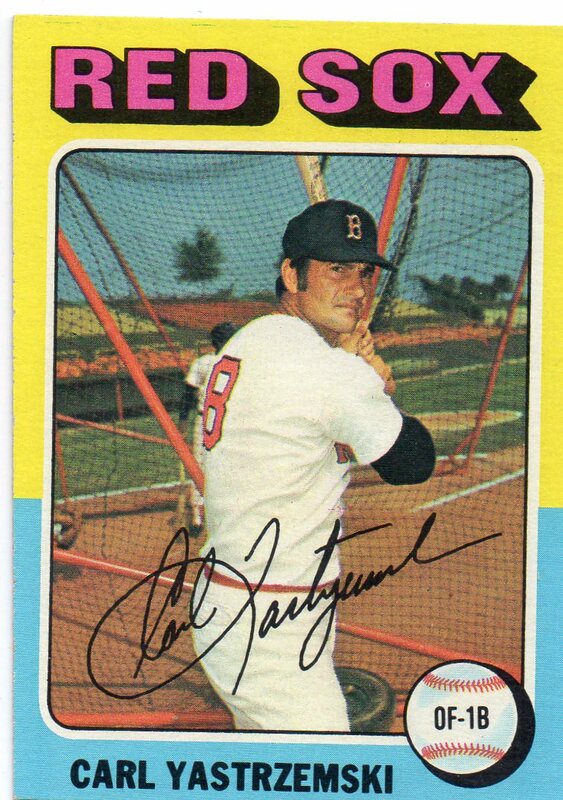 Notes From His 1975 Season: Carl Yastrzemski played in 149 games for the Red Sox in 1975. He hit .269 on the year with 146 hits in 543 at-bats. Of his 146 hits, Yaz connected for 30 doubles and 14 home runs while scoring 91 runs and driving in 60. Yaz was chosen as an All-Star in 1975 and he finished in 30th place for the AL MVP Award. Notes From Career: Yaz is one of the greatest stars from his era. His numbers are on par with the sport’s greats – 3,419 hits, 452 home runs, 1,844 RBI, 1,816 runs scored, 168 stolen bases, and a career batting average of .285. In Yaz’s 23-year career, he finished in the Top 20 for the MVP award 12 times, while earning the award in 1967 with his .326/44/121 performance. Finally, another sweet Allen & Ginter card for the ’30-YOC’ collection. 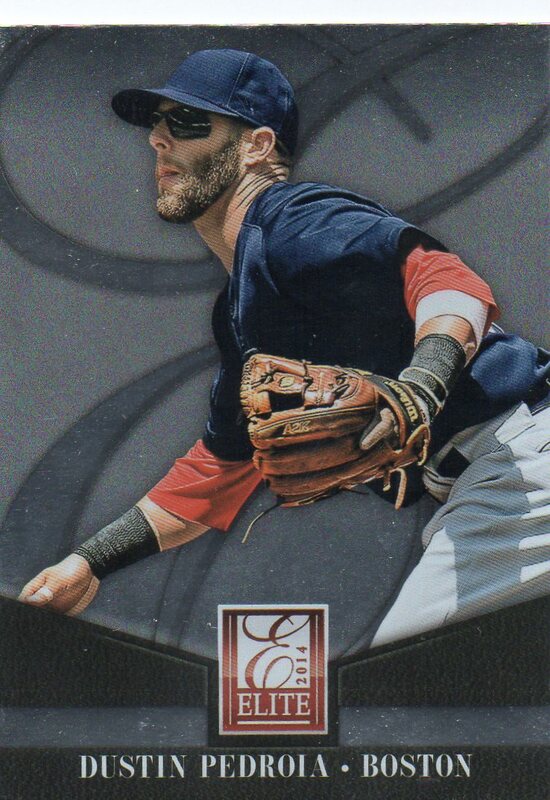 It took me some time to find another one as I find this set to be full of boring and bland ‘stinkers’, but this card of Dustin Pedroia is on par with the Jose Fernandez card I featured here a few weeks back. I love the horizontal style of this action-packed card – it is a nice deviation from the typical posed portrait, vertical style that has bored me of the Allen & Ginter brand. And the sharper, stronger colors of the background is a very welcomed change from the muted watercolors that has been the standard for the last few years. 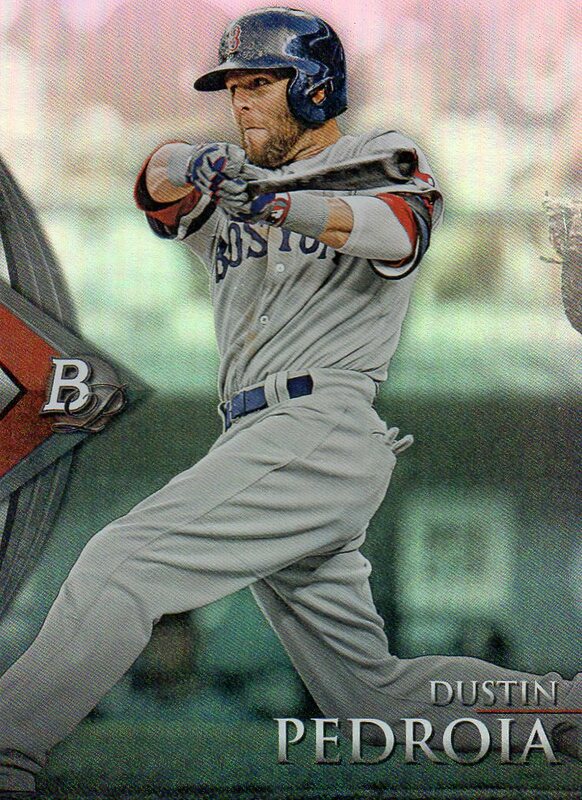 This card is a very solid addition to my Dustin Pedroia PC.